The proposed factory for Force Protection Equipment between Government Arsenal and Samyang Comtech. Photo c/o Government Arsenal. 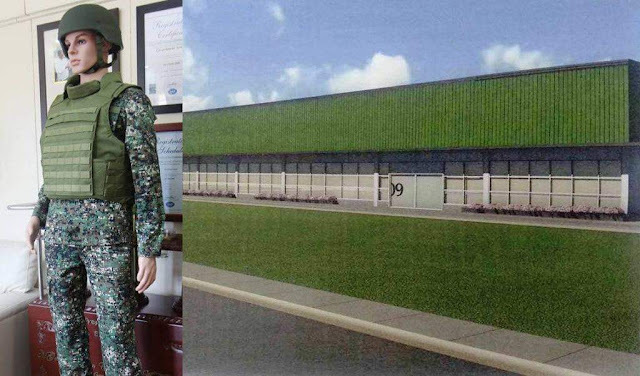 The Philippines’ Department of National Defense (DND), through its arms production agency Government Arsenal (GA), started the convert one of its factories into manufacturing facility for force protection equipment (FPE) including body armor and kevlar helmets. It also started building a new factory to house the manufacturing of rifle magazines. The force protection equipment factory is undertaken through a co-production agreement with South Korea’s Samyang Comtech Co. Ltd.. Meanwhile the rifle magazines factory is being undertaken under a co-production agreement with Bu Heung Precision Co. Ltd., also from South Korea. The factories are all built within GA’s facility in Fort Antonio Luna in Limay, Bataan province northwest of Manila. GA and Samyang Comtech expects an annual production of up to 20,000 FPEs, while GA and Bu Hueng Precision’s rifle magazine production will focus on 30-round 5.56mm STANAG magazines. Both ventures eye supplying the Armed Forces of the Philippines and all other armed agencies of the Philippine government. As part of the agreement, both South Korean companies will eventually transfer the production technology to GA, to boost its self-reliance capability as part of its revived Self Reliance Defense Posture (SRDP) Program.